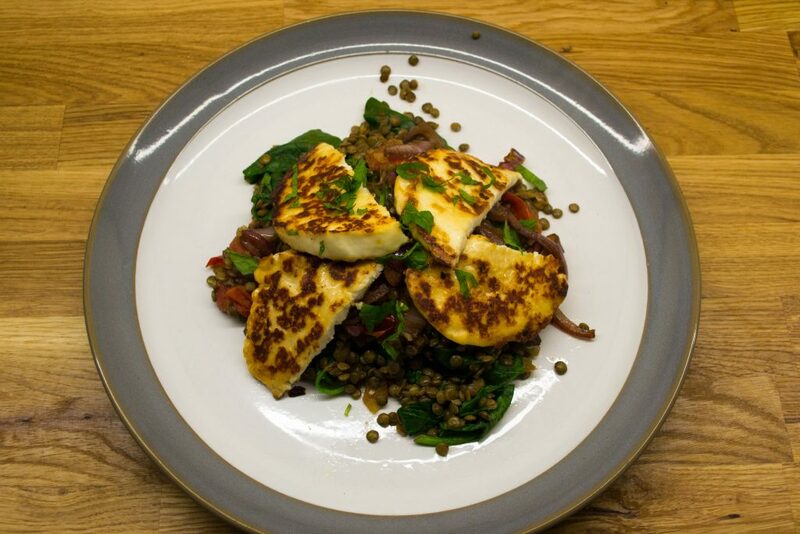 Halloumi is a guilty pleasure of mine as I’m afraid I haven’t managed to find it anywhere without plastic packaging. That said, I don’t have it often and it is absolutely delicious. The caramelised onions and mint really make this dish and I love the combination of flavours. This recipe makes enough for two but why not double up and have it for lunch in the week ;). It takes about half an hour but probably a bit longer the first couple of times. The first thing to do with this recipe is to begin cooking the lentils. Put the lentils in a saucepan with some boiling water and boil for 15 minutes. While the lentils are cooking, finely chop the white onion, halve the cherry tomatoes, chop the garlic and mint and slice the halloumi into 8. 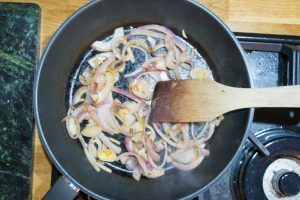 Put some oil into a saucepan and add the white onion and cook for around 5 minutes. While that is cooking, slice the red onion into half moons and heat another saucepan with oil in it. 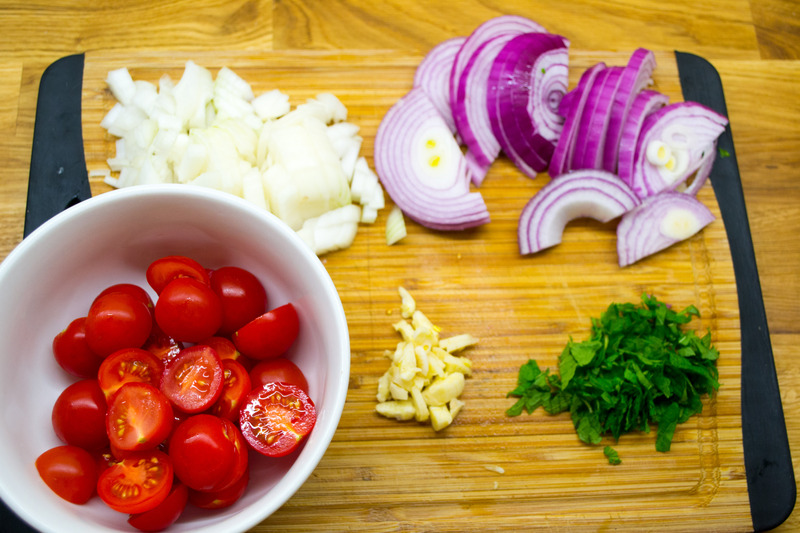 Add the tomatoes to the white onion and some salt and pepper and cook for another 5 minutes. Add the red onion to the other saucepan and cook for around 5 minutes until the onion is soft. Next add the garlic to the white onion and tomato mix and cook for another minute or so. Your lentils should be about cooked now so you can drain them and add them to this saucepan. 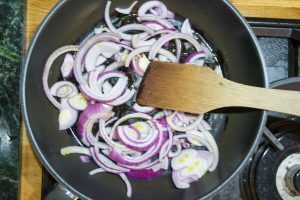 Add the balsamic vinegar to the red onions (depending on how much you like the vinegar flavour put either 1 or 2 tablespoons in with the onions). Turn the heat down and let this cook until caramelised (8-10 minutes), stirring occasionally. 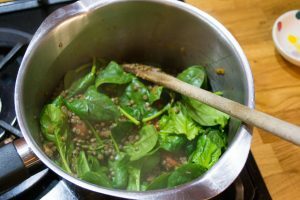 You can now remove the lentil mixture from the heat and add the spinach. Pop a lid on this saucepan and leave the spinach to wilt down. In the meantime, heat a frying pan with some oil in it and lay the halloumi in the pan. Cook for about 3 minutes on each side or until golden. Stir half the mint into the lentil mixture. You are now ready to plate up. I like to put the lentil mixture on first then halloumi slices and caramelised onion. Sprinkle over the rest of the mint. And there you have it, a lovely dinner in around half an hour (once you know what you are doing ;).